A friend recently told me that I didn’t recommend enough novels in this column, which I thought was a little crazy, because the majority of my suggestions skew heavily toward fiction. “No,” he said, “I want to read a NOVEL.” I told him saying “novel” more loudly didn’t really clarify his point. But after thinking about it, I believe what he was looking for was a novel in the classic sense — something lengthy and ambitious, something that attempts to be A Great Work of American Fiction. So to anyone who feels the same way, I wholeheartedly recommend Stuart Nadler’s sweeping, decade-spanning debut novel, Wise Men. It’s the sort of patiently paced story you can settle into, steeped in rich characters and historical context. In the ’50s, attorney Arthur Wise successfully sues Boston Airways on behalf of the victims of a plane crash. The Wise family suddenly goes from a lower-class Jewish family to one of the wealthiest and most famous in the country. This complicates the relationship between Arthur and his teenage son, Hilly, from which the book takes its perspective. Hilly befriends the family’s black caretaker, Lem, who lands in prison after Hilly lies to save his own hide. Lem never makes it out. I know it’s early in 2013, but expect Wise Men to be a strong contender among “best of” lists come the end of the year. TL;DR: The second coming of John Cheever, with hints of Philip Roth. 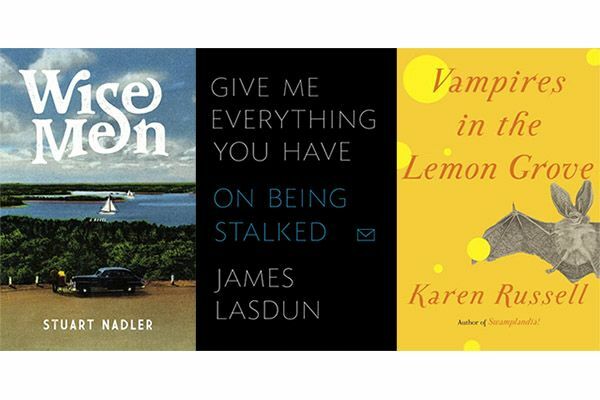 James Lasdun is a novelist, poet, loving husband, and also the victim of an extreme case of cyber-stalking. A harmless mentor/mentee relationship with one of his more talented creative writing students, Nasreen, quickly turns troubling when she becomes suggestive, then obsessive, then dangerous (she threatens to “ruin him” with “verbal terrorism”). The book speaks volumes to Lasdun’s talents as a storyteller. Considering that most of the action takes place over email — a sort of non-place that’s not that interesting to imagine — Lasdun fills that space with a palpable, existential dread. Without giving too much away, the book never gets violent (or even physical, for that matter), but this book is frightening in its insular psychological drama. It also leads Lasdun into a powerful contemplation about the role of technology in our lives. His perspective is nuanced. Rather than take the easy road and blame technology as an enabler, Lasdun believes that it magnifies the human self. You are what the web says you are, and if it misrepresents you, the feeling of outrage, anguish, of having been violated in some elemental layer of your existence, is, as I began to learn, peculiarly crushing. Reputation (“the gentleman’s second soul,” as someone put it) is once again asserting its power to make or break us. There are a few sections of the book that drag a little bit, when Lasdun steps outside of the stalker narrative, but as a whole, Give Me Everything You Have is a gripping account of the many ways Nasreen harassed Lasdun, paired with a more patient meditation of how it affected his life forever. TL;DR: Fatal Attraction via email. I am one of maybe eight people who did not like Karen Russell’s Pulitzer-short-listed Swamplandia! But I loved this. Russell’s imagination doesn’t quite scale to novel length, but when contained to short stories, as they are here in Vampires in the Lemon Grove, her writing feels more vibrant, more alive. There’s also a kind of strangeness and humor that works better within 30 pages instead of 300. And there’s no shortage of weird concepts and monsters in Vampires. U.S. Presidents are reincarnated as horses, forcing them to ask why the hell they came back as horses; a guy and his girlfriend are tailgating at an annual competition between Team Krill and Team Whale (take a guess which team always wins); and the title story, one of the best in the book, considers what lifelong matrimony means when you can live forever (they are vampires, after all). It’s impressive how quickly Russell’s stories can go from humor to dark humor to just plain dark. For most writers, short-story collections are considered minor works. Russell is the rare author whose short fiction should be taken as seriously as her novels. TL;DR: A literary monster mash. Kevin Nguyen is a founding editor at The Bygone Bureau.